Where are you from? Your profession? I currently live in Milton, Georgia, but for 35 years I lived and worked in Cincinnati, Ohio. Before retiring in 2003, I was a professor at the University of Cincinnati for 30 years, doing research, teaching, and a small amount of administration. By training I am a developmental psychobiologist. When and how did you become interested in paddling? When young, I fished with my dad and in the process learned I loved being on the water, especially in the early morning when it’s quiet, fog hides everything except what-is-near, and the sun is just coming up. While in grad school, I felt I had no time for anything but work, but then the dad of a friend almost died in surgery and I rethought my priorities, which meant I purchased a canoe and started paddling. That was more than 40 years ago. Where is your favorite place to paddle? When I lived in Cincinnati, I loved paddling into town on the Ohio River at dusk after a lengthy paddle. The city’s lights of many colors reflected on the water, and it was beautiful, all the more beautiful if a game was occurring in the stadium on the river and fireworks were going off. Another favorite is the Buffalo River in northern Arkansas. While beautiful, majestic cliffs stand high above the paddler, the fish and boulders beneath the water are also visible. Each time I’m on this river, I realize I miss half of what is there to be experienced when I’m on other rivers. What’s the most interesting thing that ever happened to you on a paddling trip? That would have to be Paddle Florida’s “Dam to the Bay” trip in March of 2013. There were 20+ knot winds on Ochlockonee Bay, I was in a little 10-foot kayak, and many of us feared we were going to die that day. Fortunately, we all made it! When the trip ended and I was driving home, I found myself feeling competent, confident, and like a new person. Perhaps that was due just to the euphoria of having survived. Lesson learned: pay attention to the weather and to signs that perhaps it’s not a good day to paddle. How many Paddle Florida trips have you gone on and to where? I’ve gone on a number of them—Suwannee, Ochlockonee, and the Withlacoochee—all of them more than once. What keeps you coming back? I love camping, paddling to a new place, and camping again, and on and on. Paddle Florida enables me to do that and to do it for a week at a time and in comfortable temps each winter. It has also enabled me to make some really good friends who continue to be important to me all the rest of the year when I’m not paddling with Paddle Florida. Can you describe a Paddle Florida trip highlight? I continue to love paddling in the fog. Sometimes you can’t see which way the river bends ahead of you, or even much farther than the front of your boat. I love paddling in the rain. And I love the people I meet each trip. I love the surprises each trip can bring, for example, the windy day on Ochlockonee Bay or a 2014 Withlacoochee trip in which temps dropped down into the 20s at night. 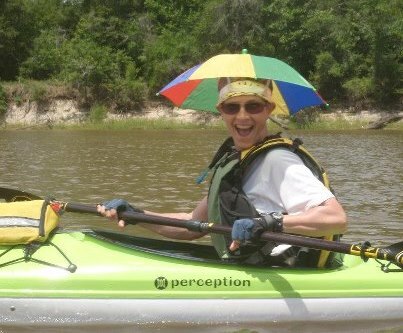 What advice do you have for folks considering a Paddle Florida trip? Pack up and go! Don’t worry about having a paddle partner. You’ll find one when you arrive the first night. Check out the weather in advance and make sure you have the clothes and sleeping bag you need for the expected temps. When it rains, you can get cold, so take appropriate clothes—including for hands and feet—to stay warm beneath your rain gear. Take a solar shower and/or wipes to clean up with on those days you don’t otherwise have a shower. For those who love hammocks, know there is always at least one night in which you are not permitted to hang a hammock. Your luggage is never weighed, so don’t let the 40-pound weight restriction keep you from going or cause you to spend a lot of money on ultra-light equipment. If you don’t have a kayak, or don’t want to transport it, rent one for while there. This is a good time to check out a particular boat to see if you’d want to purchase that model and size. If you have questions, contact Bill or Jill. Most important: go, relax, and have fun! And, if I’m there, make sure you introduce yourself to me. I’d like to know you.